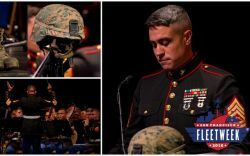 Please join us for the 2018 Honor Our Fallen Concert at the Marines' Memorial Club Theater in San Francisco on Oct. 4 at 6pm during the 38th Annual San Francisco Fleet Week. This special program designed by Major General Michael Myatt, USMC (Ret.) features the 1st Marine Division Band - and for the very first time, the Navy Band Southwest. The concert is a poignant tribute to the service members who volunteered to defend their country and gave the ultimate sacrifice. As seating is limited, please take a moment to register to ensure your seat. The concert is FREE and open to the public.